Mill-Max introduces shrouded male pin connectors for applications where a robust, secure connection is demanded, such as frequently mated interconnects and blind mate conditions. 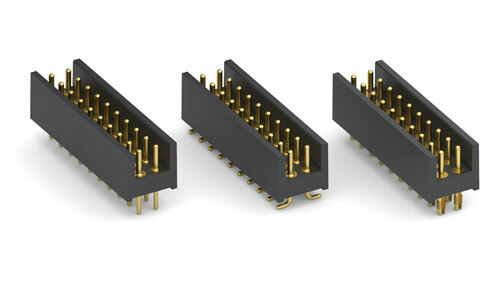 These double row connectors come in 4 to 64 pin configurations and are available in through- hole and surface mount termination styles. Both the through-hole and surface mount versions are dual row with .100" (2,54 mm) spacing pin-to-pin and row-to-row. The connector body is molded from Ryton, a high temperature, durable thermoplastic with excellent thermal stability, chemical resistance and a flammability rating of UL94 V-0. The pins are made of precision-machined brass. The engaging leads are .030" (0,76 mm) in diameter, .142" (3,61 mm) long and gold-plated to provide a secure and reliable connection. These connectors are RoHS-2 compliant and suitable for lead-free reflow processes.